Periodontal disease may be a manifestation of a more systemic condition, such as diabetes, anemia, vitamin deficiency states, leukemia or other disorders of white blood cell function. In addition, it is associated with hardening of the arteries (atherosclerosis) and an elevation in C-reactive protein (CRP)– which is an important marker for systemic inflammation and an independent risk factor for heart disease. 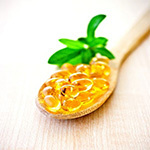 Long chain omega-3 fatty acids EPA and DHA found in fish and fish oil supplements have been shown to be protective against atherosclerosis, as well as being useful in the treatment of a wide range of inflammatory mediators. It seems only natural that a recent double-blind study would show significant benefit with fish oil supplementation in patients with periodontal disease. Enhance immune status (defects in the immune system, particularly white blood cells—especially neutrophils—are catastrophic to oral health). Although there are many nutritional considerations in the goals listed above, supplementation with fish oils would appear warranted based upon the possibility of achieving some of these goals – especially the ability to reduce inflammation. A higher dosage of EPA+DHA may be necessary to lower CRP levels – a key marker in systemic inflammation. Deore GD, Gurav AN, Patil R, et al. Omega 3 fatty acids as a host modulator in chronic periodontitis patients: a randomised, double-blind, palcebo-controlled, clinical trial. J Periodontal Implant Sci. 2014 Feb;44(1):25-32.